For overhead lines, operating on higher voltage, use of number of discs connected in series is made. The whole unit formed by connecting a number of discs in series is known as string of insulators. The insulators consist of metal fittings and metal fittings of each unit has a capacitance relative to metal fitting of next unit. The capacitance due to two metal fittings on either side of an insulator is known as mutual capacitance. Further there is also a capacitance between metal fitting of each unit and the earth or tower. The capacitance formed is known as shunt capacitance. The voltage impressed on a string of suspension insulators does not distribute itself uniformly across the individual discs owing to the proximity of supporting structure.. The line unit ( unit nearest to the conductor) shall have to withstand the maximum percentage of voltage, the figure progressively decreasing as the unit nearest the tower is approached. The inequality of voltage distribution between individual units is all the more pronounced with a larger number of insulator units and also depends on the ratio of capacity of insulator to capacity to earth. The ratio of flash over voltage of n units to n times of flash over voltage of one unit is called the string efficiency. The ratio of voltage across the whole string to the product of number of discs and the voltage across the disc nearest to the conductor is known as string efficiency. When the insulators are wet mutual capacitance increases while shunt capacitance remains constant ( except for the unit nearest to the cross - arm) so the ratio of shunt capacitance to mutual capacitance decreases, more uniform potential distribution is obtained and the string efficiency improves. String efficiency is an important consideration since it decides the potential distribution along the string. The greater the string efficiency, the more uniform is the voltage distribution. Although it is impossible to achieve 100% string efficiency, yet efforts should be made to improve it a close to this value as possible. The below figure shoes the equivalent circuit for a 3 disc string. Let us suppose that self capacitance of each disc is C. Let us further assume that shunt capacitance C1 is some fraction K of self capacitance i.e C1 = KC. Starting from the cross-arm or tower, the voltage across each unit is V1, V2 and V3 respectively as shown. Applying kirchoff's current law to node A. The following points to be noted from the above mathematical analysis and for solving problems related to string efficiency. The greater the value of K the more non uniform is the potential across the disc and lesser is the string efficiency. The inequality in voltage distribution increases with the increase of number of discs in the string. Therefore, shorter string has more efficiency than the larger one. The maximum voltage appears across the disc nearest to the conductor. The voltage across the string is equal to phase voltage i.e. voltage across string is equal to voltage between line and earth is equal to phase voltage. Line voltage = √ 3 x voltage across string. There are several methods of increasing the string efficiency or improving voltage distribution across different units of a string. Long cross - arm method: It is clear from the expression of string efficiency that the string efficiency increases with the decrease in the value of K. The lesser the value of K, the greater is the string efficiency and more uniform is the voltage distribution. 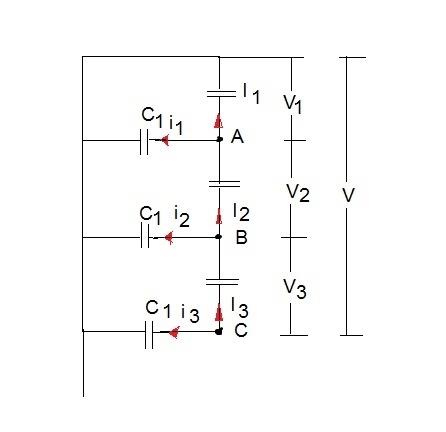 The value of K can be decreased by reducing the shunt capacitance. In order to reduce shunt capacitance, the distance of conductor from tower must be increases i.e, longer cross-arms should be used. However, limitations of cost and strength of tower do not allow the use of very long cross-arms. In practice, K=0 is the limit that can be achieved by this method. Capacitance grading method: Uniform voltage distribution across units of string of suspension insulators can be achieved by grading the mutual capacitance of the units i.e. by having lower units of more capacitance, maximum at the line unit and minimum at the top unit, nearest to the x-arms. This method is very inconvenient and not used in practice below 200 kv as it is desirable that units be interchangeable. Static shielding: The third method is by employing a guard or grading ring, which usually takes the form of a large metal ring surrounded the bottom unit and connected to the metal work at the bottom of this unit, and therefore, to the line. The ring screens the units, reduces the earth capacitance and introduces a number of capacitances between the line and insulator caps. 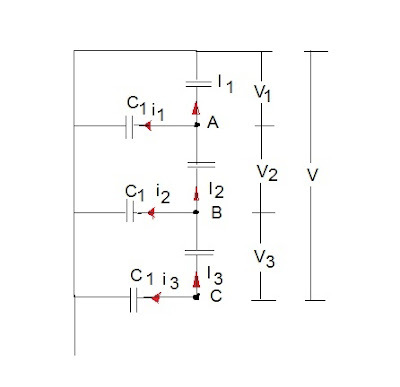 The capacitances are greater for lower units and so the voltages across them are reduced. With this method also it is impossible to obtain in practice an equal distribution of voltage but considerable improvements are possible.